VW were not known for their convertible cars until collaborations with coach builder Karmann resulted in several desirable and popular soft-tops. First the VW Karmann Ghia Cabriolet and later the Beetle and Golf Cabrios. Each can be described as an icon and have enthusiastic followers. Since then the Volkswagen convertible has become a market leader and the brand has proved it can produce convertible cars that are just as well made and practical as their hardtops. In recent times the Volkswagen Beetle and Golf Cabriolets have returned. Still with folding fabric roofs but now with modern engineering and safety standards. The Eos hardtop convertible was also introduced and is unique within the brand not only for its roof style but also for having no fixed roof alternative. 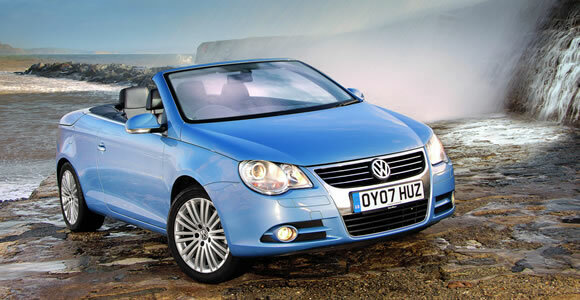 Although many people accepted the VW Eos as being a Golf Convertible the majority of the car is unique and the Fabric roof Golf Cabriolet released in 2011 is much more closely related to the hatchback (and the Audi A3 Cabriolet). So far the VW Golf Cabriolet has been limited to the European market despite the requests of many frustrated American buyers.